Property News: How will GST impact home prices and the property market? WITH the implementation of Goods and Services Tax (GST) in April 2015, many Malaysians are concerned with what this bodes for prices in general. It is inevitable that home prices will also be affected. To appreciate how GST will affect home prices, it is necessary to first understand how it works. Aside from GST, one must understand the Sales Tax, which is the existing tax scheme affecting the property sector. GST will supplant the Sales Tax come April next year. A similarity between GST and the existing sales tax scheme is that no taxes are charged or will be charged to the consumer on the purchase of a home/residential property. For GST, residential properties fall under the “exempt rated” basket of goods. But do note that GST charged to the consumer for commercial property purchases as commercial properties are “standard rated”. During the creation of the final product, also known as the input stage in tax parlance, under both tax schemes, developers would incur taxes during their procurement of inputs and materials. This is where the differences emerge between both tax schemes. The tax rate for inputs and materials vary between GST and sales tax. Based on the Sales Tax Act of 1972, basic building materials such as bricks, cement and floor tiles fall within the First Schedule Goods category in which all the goods here will not be subjected to sales tax. Other building materials fall within the Second Schedule Goods category. The goods here will only be charged a sales tax of 5%. Under the new GST, all building materials and services (such as contractors, engineers) will be subjected to GST with a standard rate of 6%. This will invariably raise the production cost for developers. If you understand how GST works, you will observe in most cases, the additional tax cost will simply be passed on to the final consumer (standard-rated goods), or which is claimed back from the government (zero-rated goods). But, in this case (exempt-rated), the additional tax cost is borne by the party before the final consumer – the developer. This seems like good news for homebuyers as they do not have to pay GST when purchasing a home. However, what’s to stop developers from trying to factor in the additional tax costs into the final sale price implicitly? 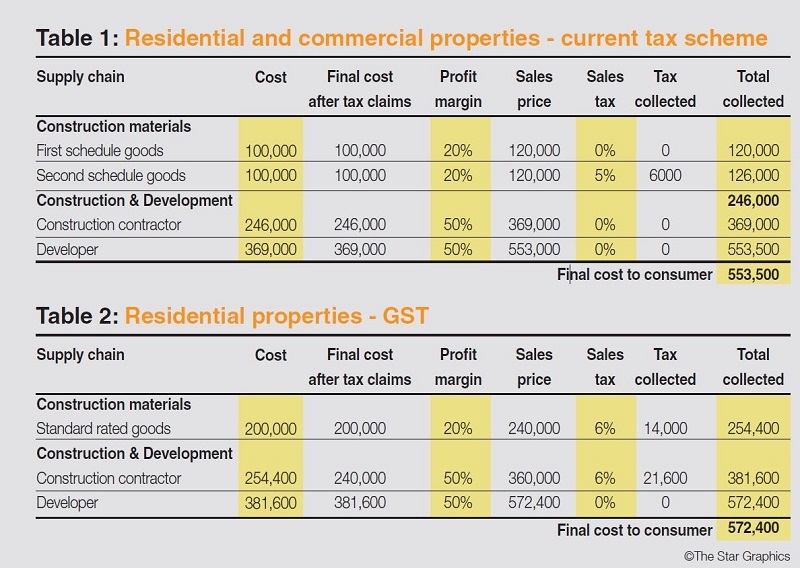 The tables show a comparison between the cost of a new property before and after GST. Certain taxes and costs leading up to the sale to the final consumer have been simplified for this purpose. Also, an assumption is made that developers are able to transfer 100% of all incurred tax costs to the consumer via the sale price. The example above shows a price increase of 3.41% for new residential properties post-GST implementation. But, there is a plus point to this. New residential properties may register a lower overall increase in tax compared to commercial properties that are standard-rated. This is because there is still a chance developers may only transfer some and not all of their tax cost increases to the final retail price. The downside to this is that where pricing for new commercial properties will be clearer (Sales price + GST), pricing for new residential homes would look inflated. This, in turn, will undoubtedly have a knock-on effect on prices in the secondary house market. As a homebuyer, it pays to know the effects of GST on home prices moving forward. (4) The secondary home market should see a knock-on effect in prices. This entry was posted in Uncategorized and tagged Commercial Property, GST, Property GST. Bookmark the permalink.